This week we will start a new series that I will entitle “The Politics of God”. How many times have we heard that we should not mix politics with religion? I have often wondered about that position. In a nation that was founded on Judeo/Christian principles we all of a sudden feel that mixing the subjects is sacrosanct. In a nation where we as Christians live and find ourselves citizens of earth, are we to be satisfied to let secular evil run rampant while we say or do nothing? Have we gotten so concerned with ‘offending’ someone that we are afraid to discuss the ‘truth of God’ as found in the Bible…His Word? When a position cannot be defended by God’s Word are we to just let the offended ‘win’ by getting angry and calling those they don’t agree with demeaning names? Are we to let sin rule the world by default? If our churches (Churches) can’t relate the interface of politics and religion, then who? I trust that this series will open the eyes of many to the need to discuss politics and religion in an aire of maturity and with the concern of conserving the nation that Christian principles gave us over 250 years ago. Unprotected freedom and Godly principles are not guaranteed. They can be lost when we loose concern over preserving them. We are to be good citizens of God’s Kingdom; also of the earth. Abraham Lincoln had it right. Our task should not be to invoke religion and the name of God by claiming God’s blessing and endorsement for all our national policies and practices…saying, in effect, that God is on our side. Rather, Lincoln said, we should pray and worry earnestly whether we are on God’s side. Those are the two ways that religion has been brought into public life in American history. First…God on our side…leads inevitably to triumphalism, self-righteousness, bad theology, and often dangerous foreign policy. The second way, however…asking if we are on God’s side…leads to much healthier things, namely, penitence and even repentance, humility, reflection, and even accountability. We need much more of these, because these are often the missing values of politics. Martin Luther King Jr. did it best. With his Bible in one hand and the Constitution in the other, he persuaded, not just pronounced. He reminded us of God’s purposes for justice, for peace, and for the ‘beloved community’ where those always left out and behind get a front row seat. [So the last will be first, and the first last. Matt 20:16]. He did it bringing religion into public life in a manner always welcoming, inclusive, and inviting to all who cared about moral, spiritual, or religious values. Nobody was left out of the conversation. In the world in which we live politics are always of a primary concern since they so effect our lives and the lives of those around us. We must remember that God is not partisan. God is not a Republican or a Democrat. 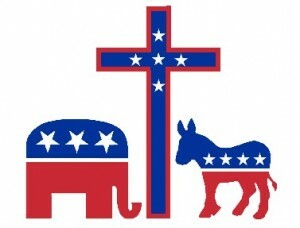 When either party tries to politicize God or co-join certain religious communities to support their political agendas, they make a terrible mistake. Faith must be free to challenge both left and right from a consistent moral ground. Before we go further into this series, and if I have not already previously done so, we might review the definition of “politics”. According to Webster’s New World Compact School and Office Dictionary, politics is the science and art of government; the principles, organization, and organization of government; factional scheming for power. We were first introduced to the basics of government in Moses’ dealing with the people of Israel. We were even given the basic origins of its organization. God has been involved with politics for a long time. The politics of God reminds us of the people our earthly politics always neglects…the poor, the vulnerable, the left behind, the ‘unforgiven’. The politics of God challenges narrow national, ethnic, economic, or cultural self-interest, reminding us of a much wider world and the creative human diversity of all those made in the image of the Creator. The politics of God reminds us of the creation itself, a rich environment in which we are to be good stewards, not mere users, consumers, and exploiters. The politics of God pleads with us to resolve the inevitable conflicts among us, as much as possible, without the terrible costs and consequences of war. The politics of God always reminds us of the ancient prophetic prescription to “choose life, so that you and your children may live”, and challenges all the selective moralities that would choose one set of lives and issues over another. In the coming weeks I will try to show that when the Church (church) abandons its responsibilities to hold our government to a Godly set of standards, the result can be and usually is catastrophic. It is the responsibility of God’s churches to be the standard bearer for the Judeo/Christian principles used to establish this nation. We cannot rely on our politicians to do that; nor our institutes of ‘higher’ learning. A political discourse that is disconnected from moral values quickly degenerates.